Have you ever thought of joining or forming a Cooking Group? 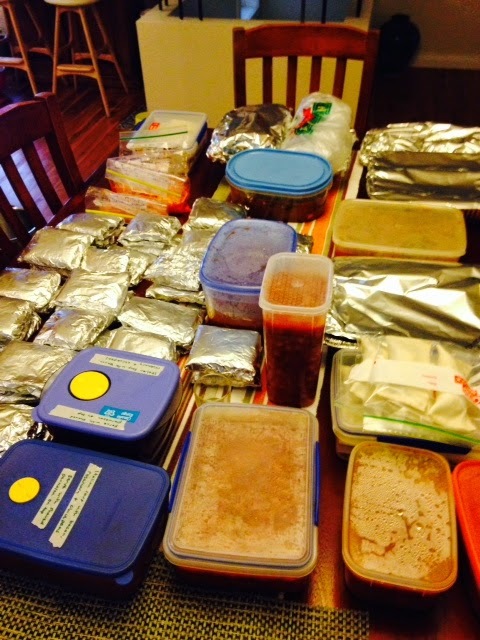 I have a bunch of friends who are mums from our local school who get together every 1-2 months to cook together. The group was formed when I started full-time work two years ago so I couldn't commit to the group, so I was on the substitute list for when someone was away. I have been 'called up' a few times but invariably I was busy on the set date, but finally I was able to join the group a few weeks ago. What a fun day! It was a little crazy, there was food everywhere, tons of washing up, but lots of great cooking smells and plenty of chattering with good friends. Four, five or six members is a good number. Any more and it will be chaos. Take turns hosting the Cooking Group. Tell the group if you have a electrical frypans/wok or a mobile hotplate. The stove area can be a little crazy during Cooking Group so it's good to have a few cooking zones. Most people do some preparation before going to Cooking Group. You may like to chop some ingredients, grate cheese, roast capsciums, toast nuts etc before arriving. This will make it a little easier during the Cooking Group time as most people underestimate how long it takes to prepare 4-6 servings of a recipe. If anyone finishes preparing their food they normally help the others who are still cooking. Many hands make light work. Don't get competitive with each other by producing gourmet or wildly creative meals. The recipes should be tasty, Monday-to-Friday dinners, not dinner party fare. And above all, have fun and a few laughs. A glass of wine is optional.